Cloudy with periods of rain. Thunder possible. High 47F. Winds N at 5 to 10 mph. Chance of rain 80%..
Cloudy with periods of rain. Thunder possible. Low near 40F. Winds WNW at 5 to 10 mph. Chance of rain 90%. White Bird Volunteer Fire Department held a training session recently at Hammer Creek Campground. Sewer system work continues in White Bird. 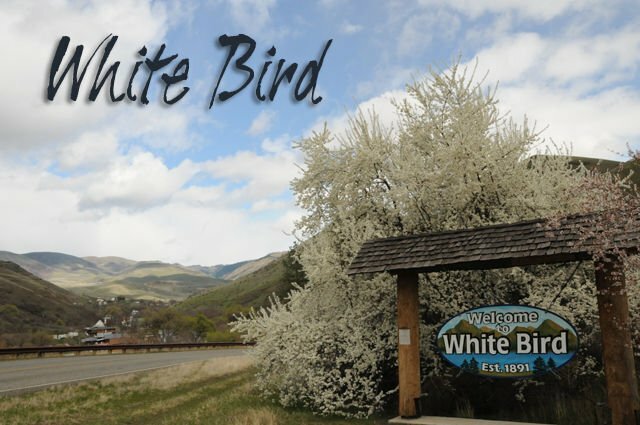 WHITE BIRD -- April showers are sure to bring on the flowers. The fruit trees are budding or blooming depending where you live. It really is beautiful to see new life coming alive after their winter's rest. Note the chamber meeting will be Thursday, April 18, at noon, at Hammer Down. We would be glad to see more business owners show up and give us input as to what you would like to see the chamber do for your business. We are spotlighting businesses each month if you get a call or a paper in the mail, fill it out and return. You probably have encountered the White Bird Grade repaving by now. Three runaway ramps and more than seven miles will be repaved this summer to enhance safety. The removing and replacing guardrails along with signage has started. Then around May, they will be repaving, reducing it to one lane in each direction. Most of the work will take place during the day with some weekend construction possible. If traveling north to Lewiston, they have started work on Winchester Grade and this work will last until around November, so be aware and plan ahead for delays. They are working hard on the water/sewer system on the edge of town. Will try to keep updates for everyone. The White Bird Fire Department had a training session at Hammer Creek Campground and was well-attended. Keeping up on all aspects of the job. Come join in the fun of exchanging plants! A Spring Plant Exchange will be held Saturday, April 27, at the WBARD building, noon to 5 p.m. Indoor and outdoor plants, ground covers, starts of plants, garden starts, herbs, and trees...don't throw it away, come and trade! Call 208-839-2303, 208-839-2305, or 208-839-2653. Do your pets need a checkup? The House Call Vet, Dr. Kim Wolfrum, will be in the White Bird area on Thursday, April 18. Call her at 208-553-9283 to stop by and see your pet! The Turkey Shoot starts at 8 a.m., on Saturday, April 13. This takes place at the White Bird Gun Club. If you are looking for a great cause to participate in, then join in on the 21st Annual Hikin’ for Healthy Hooters/Cure for Cancer Walk on May 18. Pollock Cancer Walk and Barbecue starts at the Miner's Supply at 10 a.m. on 35 Old Pollock Road. Entries need to be in by April 25. The Pinehurst Quilters will be hosting a quilt raffle and you can contact any member to get your tickets. Silent auction items are needed; contact Nightfeather at 208-628-2394 or Lou Buchanan at 208-628-3624. The annual Easter Egg Hunt will take place on Saturday, April 20, 10 a.m. (PDT) at the WBARD grounds. Toddlers through 6th grade aged children are welcome to come down and greet the Easter Bunny. Enjoy the laughs and excitement of the little ones as they find their goodies. Contact Cody Farmer at 208-839-2887 or Renee at 208-839-2395, if you want to volunteer your help, or help with donations. White Bird Days are proud to announce that Mike and Marlene Heath have been chosen for the 2019 grand marshals. They are some of the founding members of the rodeo, but now live in Washington. They have returned for our celebration for years. The parade theme this year will be "My Heros Have Always Been Cowboys" and you can call Barb Lowe at 208-839-2444 to get your entries in. Use your imagination and start making plans for our celebration on June 15! The White Bird Rodeo raffle tickets are out with some great prizes...Autographed mounted skull head from Leighton Vander Esch, Jet Boat Trip, $200 CASH, subscription from Life Flight and $100 gas gift card. Get your tickets at the General Store, Hammer Down, Silver Dollar Bar, Canyon House, our queen or any rodeo member. The Pepsi posters are going out this week, so watch for them. New this year will be the miniature Bucking Bulls on Saturday only. Come out and help the rodeo celebrate their 30th year and Let 'er Rip!! Cribbage winner was Janis Comrie. Three more weeks and then 27th will be the last card game before they stop for the spring and summer months. Birthday wishes go out to Ailiyah Pineda, Anna Ousley (14th), Lydia Crane, Melinda Hagen (15th), Ashley Poxleitner, Jarom Farmer (16th), Renee Farmer, Dan Cook, Marion Gortsema (17th), Kaleb Glen Bass (18), Kevin Zumwalt (19). Anniversary wishes go out to Jim & Dot McCulley , Brandon & Jessica Cook (14th) and Jim & Patty McGarvin (18th). 2. The farm was cultivated to produce produce. 3. He could lead if he would get the lead out. 4. The soldier decided to desert his tasty dessert in the desert. 5.When shot at, the dove dove into the bushes. 6.The insurance was invalid for the invalid in the hospital bed. 7. They were too close to the door to close it. 8. To help with planting, the farmer taught his sow to sow. 9. Upon seeing a tear in her painting she shed a tear. 10. I had to subject the subject to a series of tests.